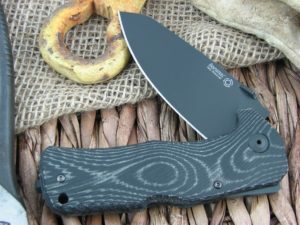 The TM1 was a venture to use micarta and carbon fibre for the monolithic onepiece construction of the handle using four-centreline machining stations. 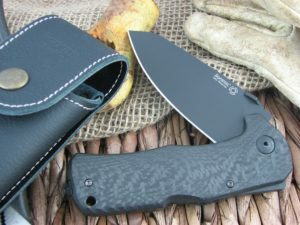 The blade is available either satin finished or black. 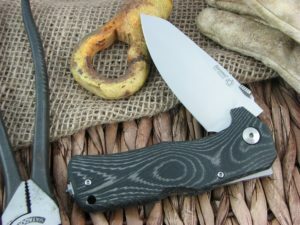 The clip can be fitted on either side of the handle, making this knife totally ambidextrous. The double spring lock back mechanism ensures greater flexibility in the mechanism and improved durability of the locking system. 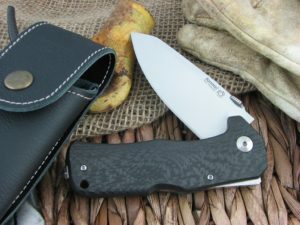 TM1 is fitted with a glass breaker and a tungsten carbide point. To enhance the knife mechanism, it has been supplemented with the IKBS system which envisages ball bearings to facilitate the blade sliding motion.